Club Penguin Igloos With Puffle Backyard! Hello everyone. Our friend from the CP team, Polofield, recently announced something I'm sure we'll all be greatful for. Coming this January 22, 2014 Club Penguin will add backyards to all igloos. We've all had that problem where we had to choose some puffles over other puffles because there wasn't any room in our igloos. 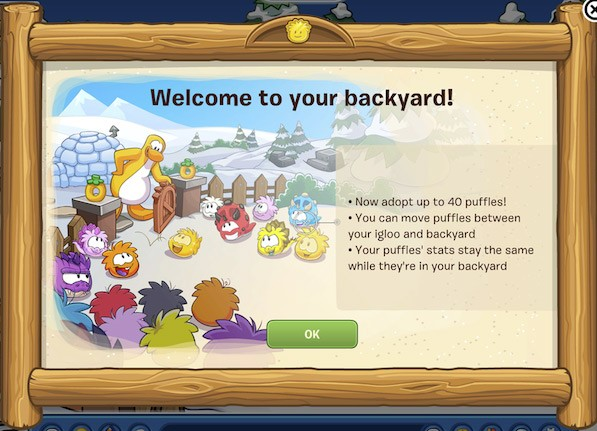 With the new puffle backyards, that problem goes away! Not only do you have more room in your igloo, you can also adopt and keep up to 40 puffles! You also don't have to worry about the stats of your puffles (like hunger, energy etc..) because they stay the same as long as they're in your backyard.